More Moves Aren't Always Best..... Except sometimes they are! I've been on a bit of a burr whirlwind recently and have really enjoyed myself! 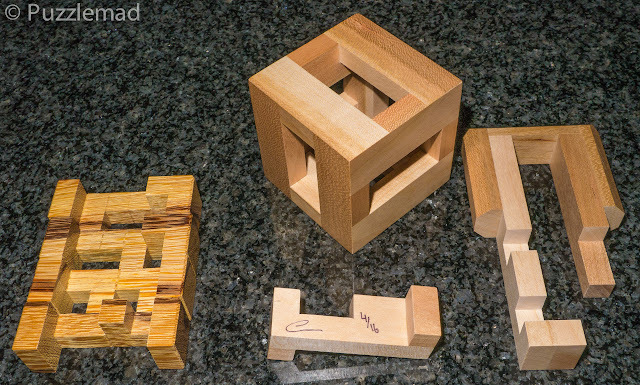 Below I will be discussing some recent puzzles I solved with the theme of trusting the craftsman to make good choices. Many people are either attracted to or repulsed by high level burrs and I have flip-flopped between both feelings. I do own some incredibly high level burrs and am proud to have them in my collection but am aware that I don't have the skills to solve them. They make great talking points and look gorgeous on my shelves but after the first few, I really stopped buying any more. Most of the burrs I have bought recently have something much more interesting to them in terms of solve process or have a very interesting shape/look. 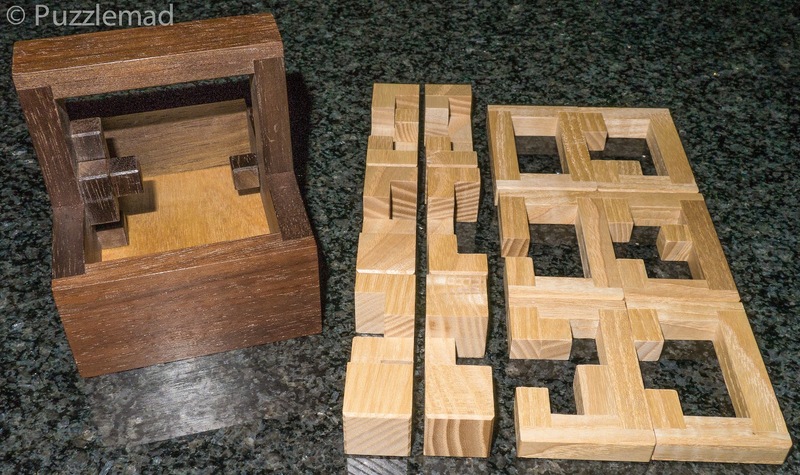 I really want to have a chance of actually solving the puzzle to get maximum value from my purchase. Of course, there has to be an exception that proves my rule and above is that exception! 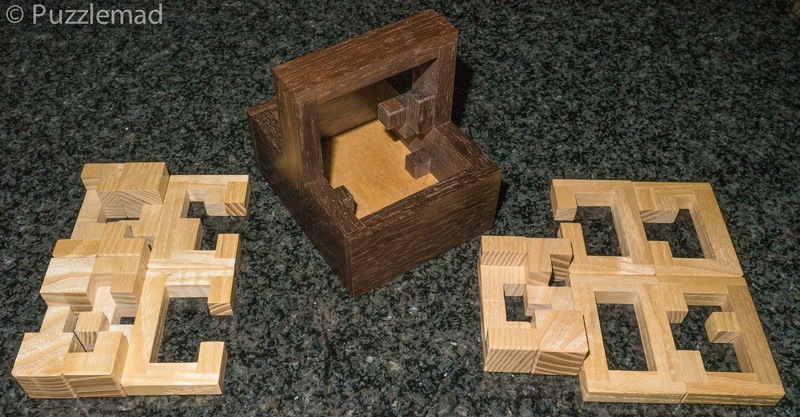 It is the Delirium 13 puzzle designed by Stéphane Chomine and then altered slightly and beautifully crafted by my good friend from South Africa, Johan Heyns. 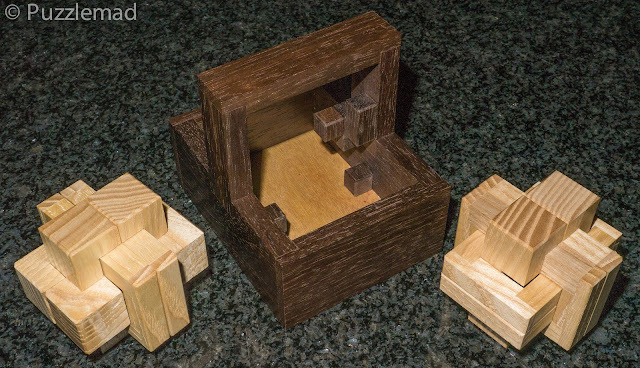 This fabulous construction in African Rosewood, Pau Marfim, Cedrella and Burmuru for the frame with Rosewood and Cherry for the burr pieces even came with a tool to allow me to dismantle the frame and reset if needed. With 5461 moves for the first piece I might just need that there tool! So why did I buy it and go against my edict that high level burrs are not something I should be collecting? 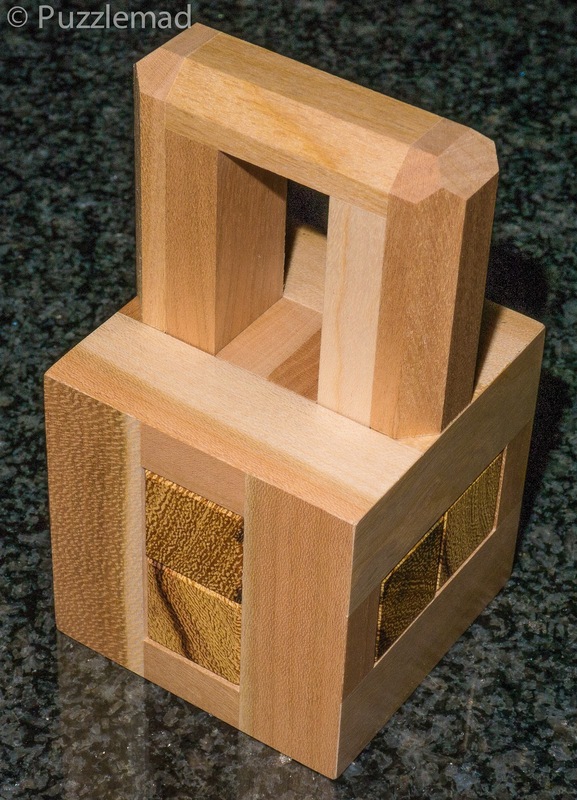 Well as well as wanting to support Johan, it should be noted that this is not just any old burr.... it is an N-ary puzzle and is very similar in process to Bill Cutler's Binary Burr. The upshot of this is that once the logical sequence is fathomed, then it is just a matter of stamina and getting through to the end without getting lost. Despite such complexity this puzzle moves beautifully and so far has been great fun to play with. 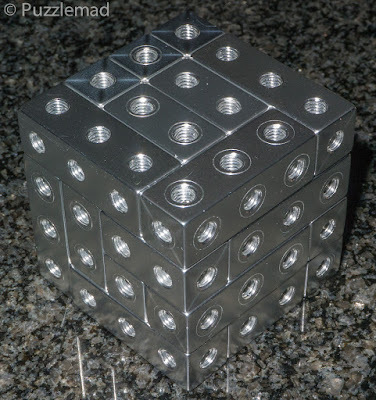 Of course, I have NOT finished it - I have attempted it twice now and each time managed probably about 2500 moves and miraculously found myself back at the beginning. Doh! I have absolutely no idea at what point I got turned around but it seems to be easily done and I never recognise it until I am right back to the start. Definitely NOT terribly bright! 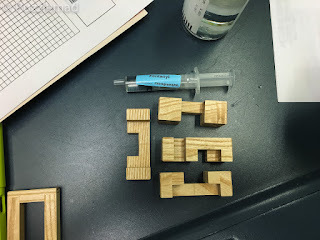 Hopefully I will shout with delight soon - I know that my friends Goetz (the king of the N-ary puzzle) and Professor Jim Strayer have managed it so it must be possible! 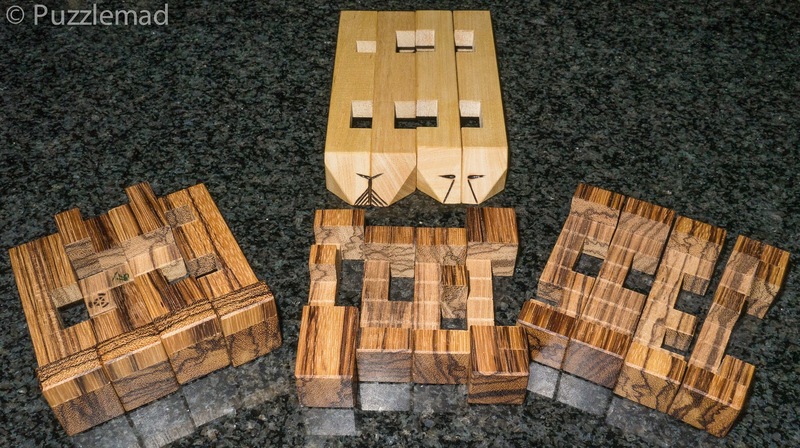 If you are not going to aim for the biggest longest burr solve then how do you choose? You could use fancy woods but I either take advice from my good friend from the Far East who has massive experience or I read the craftsman/salesman's description and take their word for it! Eric Fuller almost never manufactures super high level burrs - he aims for things that look nice and are interesting to solve. 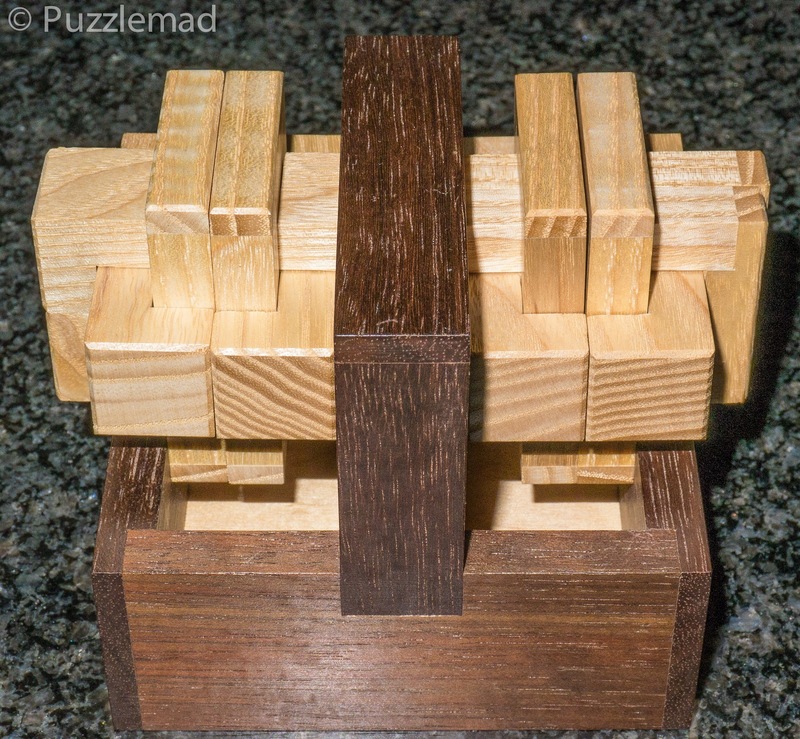 Often many of his puzzles actually have quite low level solutions but are still great fun to play with. It's been three years since Logan's excellent Constrained Burr series and his baffling Two Burrs in a Corner, but he wasn't resting on his success. He was plotting, working, scheming...to surpass his previous achievements. And boy did he succeed! Two Burrs in a Basket is a major accomplishment, with a level 2.25 just to get the pieces out of the basket! The constrained burrs were fabulous (I still occasionally get them out to play) and so I just HAD to buy this "better" challenge. 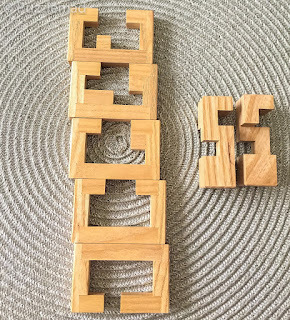 On top of that, there are multiple challenges - firstly getting the pieces out of the basket is tough but then you need to make 2 six piece burrs out of the 12 pieces - 6 sticks and 6 boards and finally you need to find a way to display the 2 burrs in the basket. Obviously after that the aim would be to return to the start position. I cannot believe that Eric did not sell out - there are currently 7 in stock as of writing this post. Even after removing these first burr sticks, it is still not an easy thing to remove the little pile of boards - they are also well entrapped in that basket. In all the disassembly is an impressive level 2.25.2.1.3.7.1.1.1.4.2.2 and a fun thing just by itself. It's vital to keep track of the order! Whew! That alone was a hell of a challenge! I'm not very good at assembling burrs from scratch (despite having some truly gorgeous burrsets) so I cheated a bit with Burrtools to find out which combination went into each of the two burrs. Just making a single 6 piece burr is actually pretty easy - there are 693 different ways for using various combinations to make a single one. I did manage that several times before I cheated. 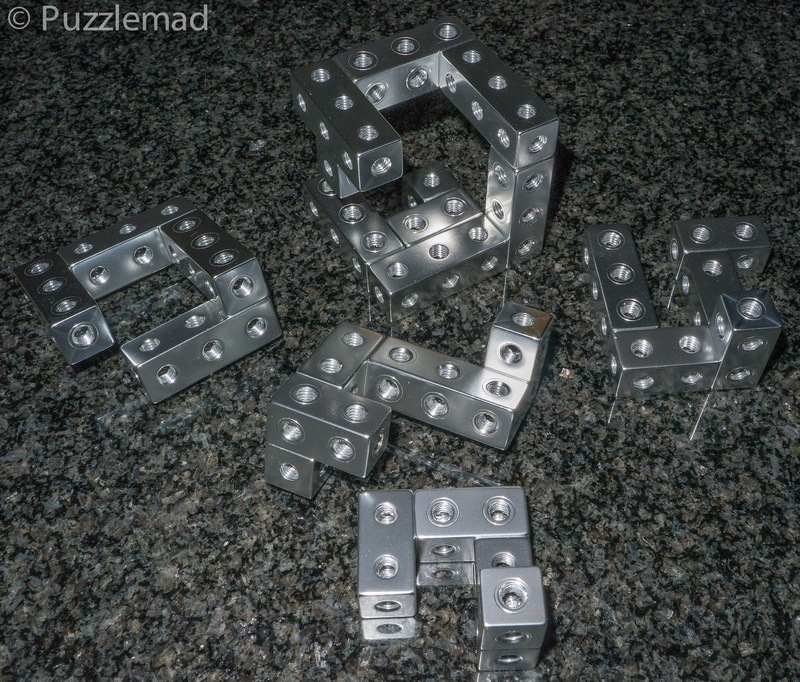 However, making a pair of 6 piece burrs with the pieces is only possible in one way and there was no way I would have managed to work that out myself. Having found out the correct pairings, I then went away and spent several evenings dropping pieces on an increasingly pissed off cat and failing to make the burrs. I finally, after a whole week, managed to assemble one of the burrs. This was the one with 4 sticks and 2 boards. The other one was completely beyond me. If you want to know which sticks/boards should be in each of the burrs then click the spoiler button below. With huge shame, I have to admit that making the second burr was done by that wonderful computer program and seeing the moves required there is no way I would ever have done it from scratch myself! I can now assemble and disassemble the burrs at will - either of them would make very nice disassembly puzzles on their own. It is even possible to put the burrs back into the basket in such a way that they will not fall out when inverted - just a magnificent challenge from Logan and Eric - well worth buying and still in stock! Next up in my "interesting but not high level burr" purchases was another from Eric. This one was designed by Tim Alkema who has also spent some time specialising in burrs with unusual shapes. It is the Padlock Burr (obviously designed to look like one) and is also still available for sale - there are 5 left as I write. 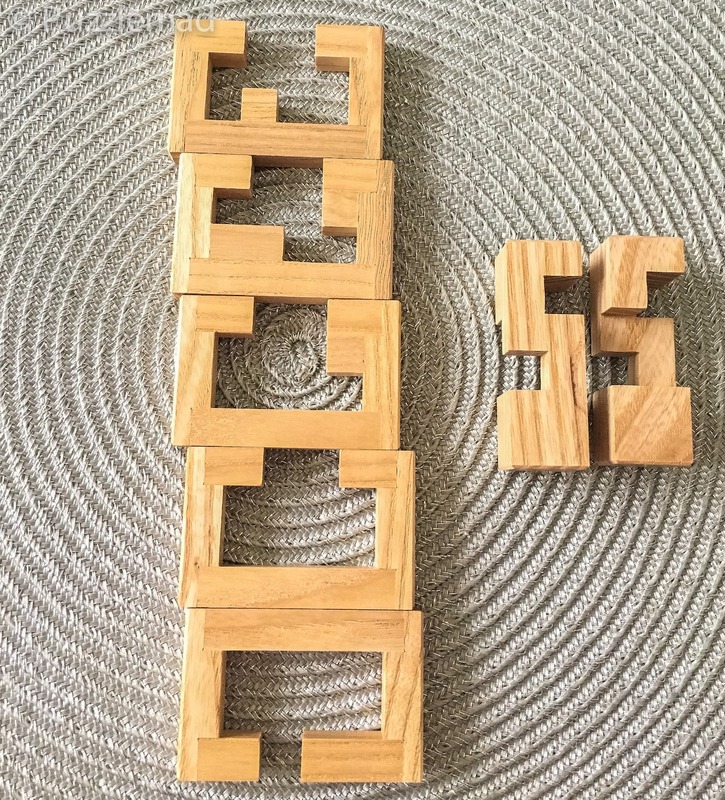 I've seen several designs lately with burr puzzles conspiring to look like other objects...a sword, an elephant...some weirdo even made one that looked like a chicken! But in my mind, none is as apropos as a padlock, so I jumped on the chance to make the Padlock Burr when it came around. Six mostly standard looking pieces interlock within the lock base for a unique and quite tricky level 24.2.8 solution. Lots of fun, and it looks cool too. I also came up with an antire new joint to make the padlock base out of twelve solid pieces instead of gluing up a bunch of sticks. It was tricky but totally worth it (this is how I have my fun these days). Eric sends them out assembled and you should be grateful for that! I had the unenviable task of emulating my wonderful friend Laurie who always starts with disassembled puzzles and it was a fantastic challenge! After an evening of clinking with metal and getting a lot of laser burning stares as well as a Whack! Ouch! 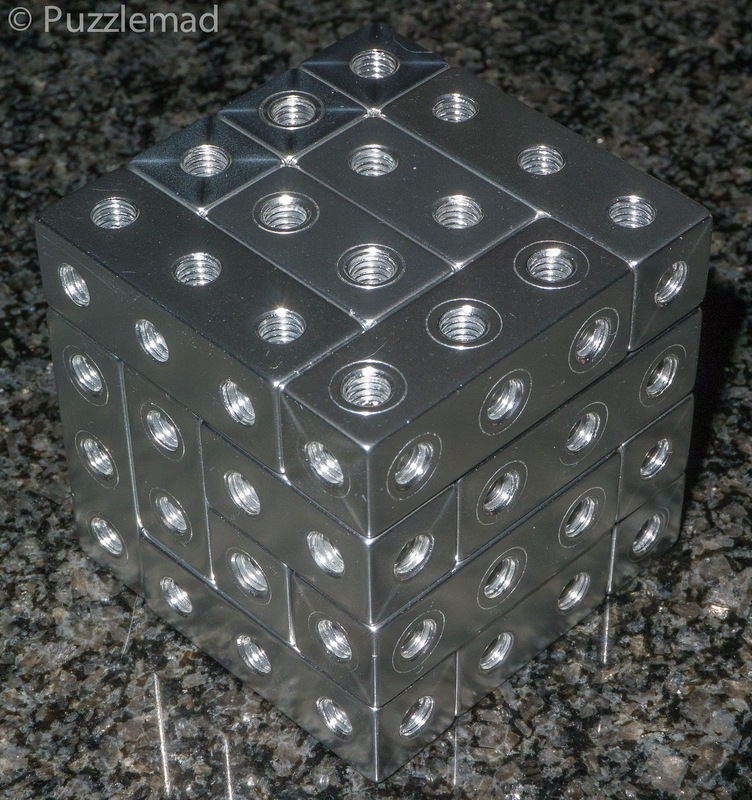 from Mrs S, I finally managed to assemble a 4x4 cube! Be quick and see whether you can nab Eric's final copy - it is a wonderful puzzle! 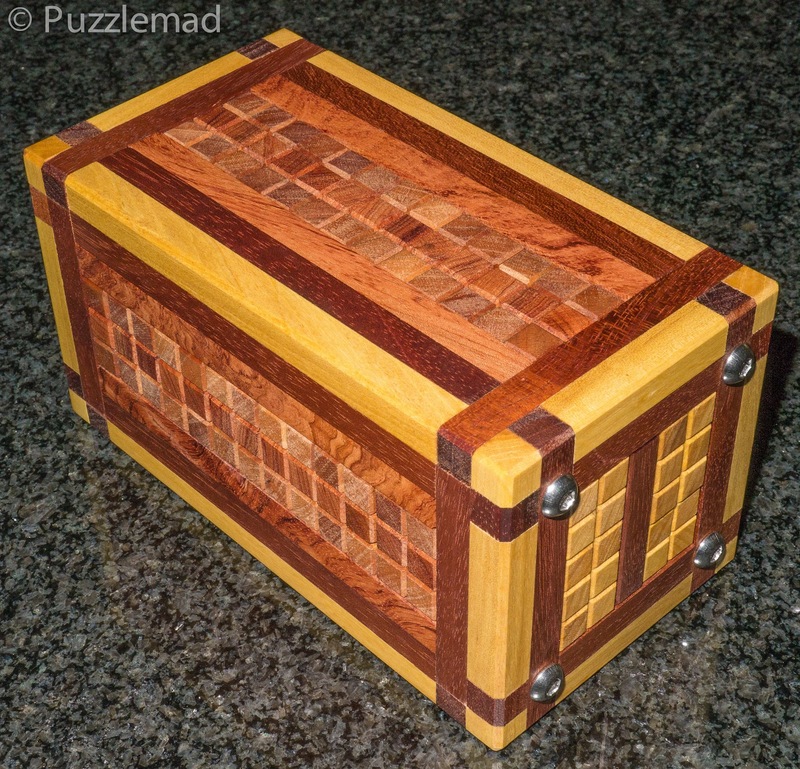 Yet again the craftsman chose well! Moving on from Eric's wonderful choices, I couldn't resist showing off Maahes made for me by the incredible Stephan Baumegger and designed by promising Scottish newcomer Terry Smart who also shows special interest in puzzle designs with different shapes. 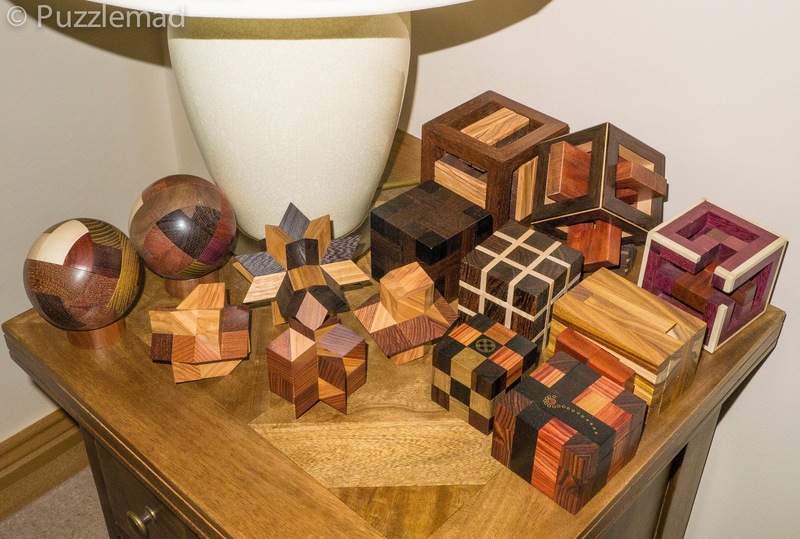 Stunning wood and fun to disassemble. So my lesson for the week is buy the burrs for the fun of them and not think too much about the level of the solution! Most really high level burrs are beyond most human beings and end up either not being attempted (having them on display in a collection is not necessarily a bad thing) or causing too much distress. Choose some slightly lower levels for your enjoyment with enough to challenge you and still be fun. I very seldom will buy anything higher than level 45 or 50 (first move) because it does become far less fun and let's just say that this is all about fun! Mrs S is getting fed up! What do you think? Is this too much for a dining room sideboard? Well Mrs S has been doing some spring cleaning and this forced her into the dining room (which we seldom use as we eat in a dining area off the kitchen). Whilst in there she sort of noticed that "things" had multiplied and is NOT happy about it. 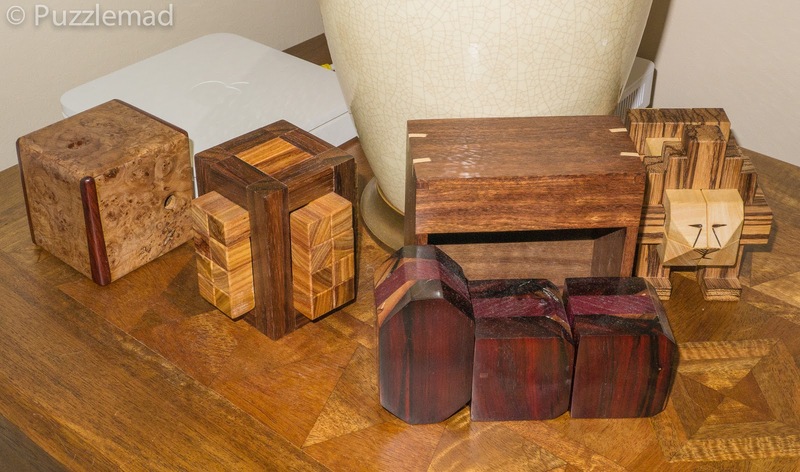 The bigger and most beautiful pieces in my collection from Shane, Johan, Stickman, Bill Cutler and my Burr sets are there and I think they look fabulous! What do you think? 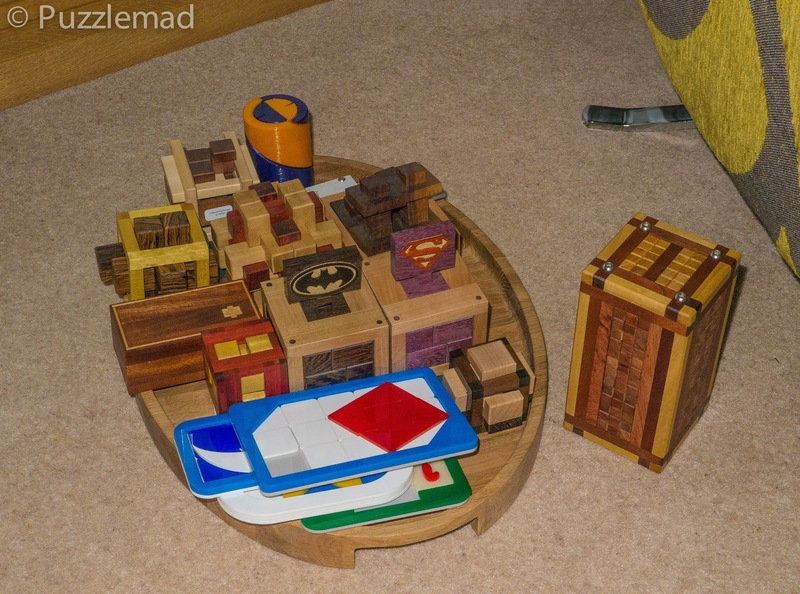 Puzzles currently being or about to be played with! She bought me a rather nice oak tray to go next to my armchair for the puzzles I am playing with or about to be. She is a little upset at the sheer number of them here. Do you think this is acceptable? Post a comment below or contact me on my special Contact page. 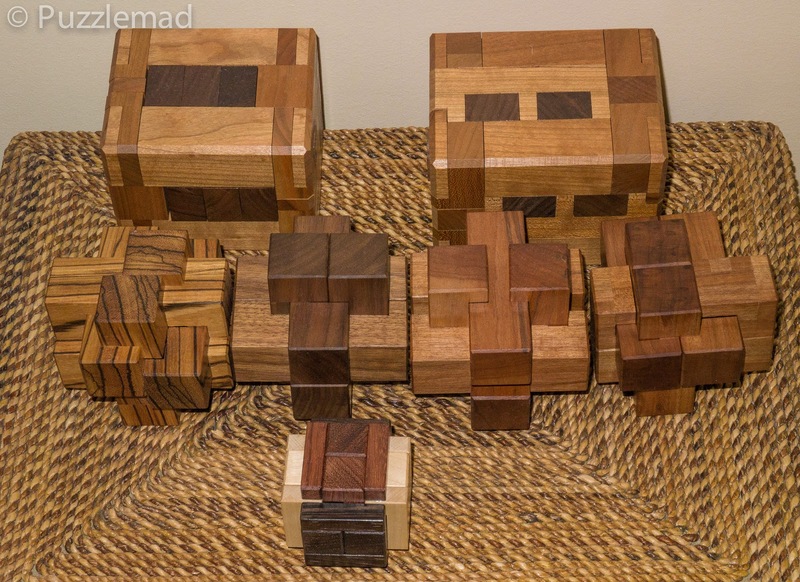 I've been a little disappointed with my Fight Cube set. Sometimes the clearance is too tight and I haven't figured out how to fix this. But at least they don't come apart, as do (plastic) LiveCubes. 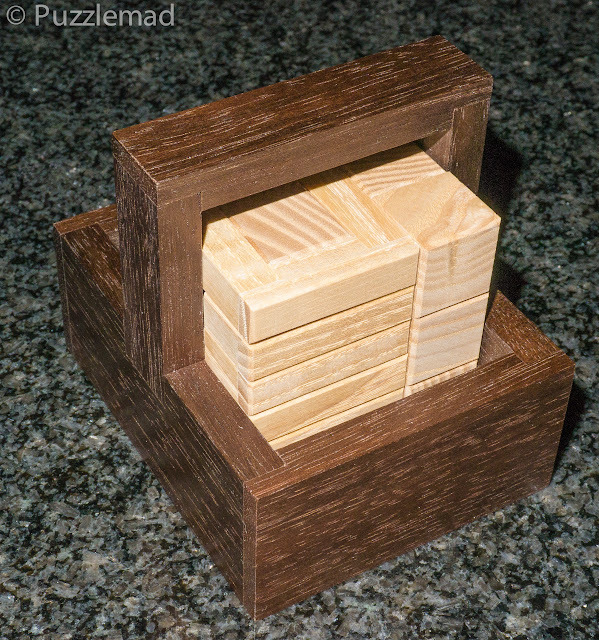 I agree George, the fight cubes aren't living up to expectation but it's purely because of the difficulty in getting things aligned and tightened adequately to hold up to movements. 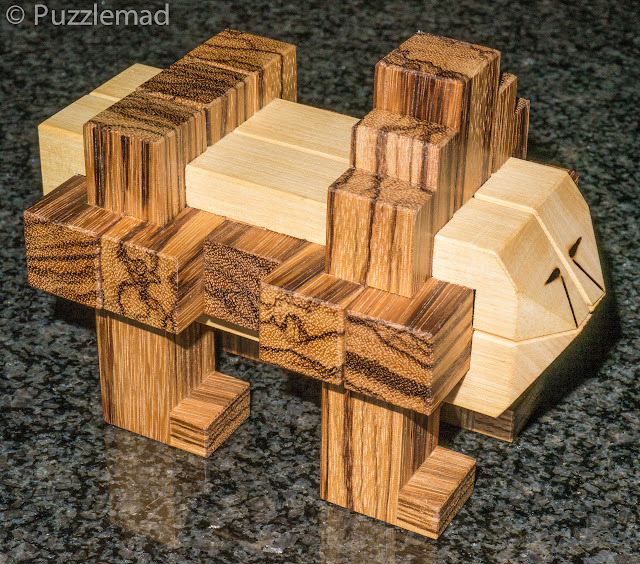 It took quite some time to get the Janus perfected but once done it was a brilliant puzzle to assemble from scratch.